And there we have it. This is the official end of Act I. This means we are 1/4th of the way through our whole story (for volume 1). Act I is a good representation of “Holiday Wars” as a whole so if you’ve enjoyed what you’ve already read then you’ll love Acts II & III. What can you expect? Lot’s of action and character development in Act II and then everything going to hell in Act III (because that’s how stories are usually structured). Since Act I is a perfect breaking point for “Holiday Wars” I just wanted to take a moment and address that we will not be collecting the story in a traditional floppy format. 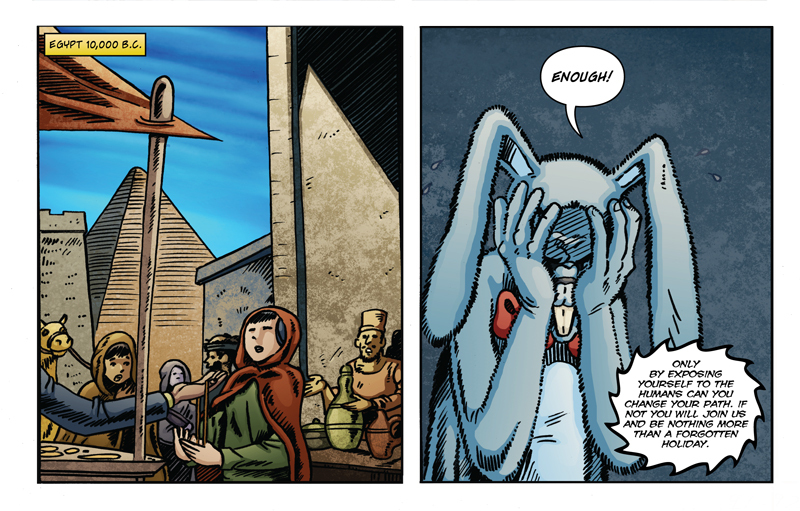 Unlike a lot of webcomics, “Holiday Wars” uses a clear three act structure and isn’t broken down into chapters. So instead of releasing chapter size floppies we will be releasing a humongous graphic novel when the story for Volume 1 is completely wrapped. On the flip side we will be offering Act I as a digital download and will be releasing it on the iPad and iPhone (an official announcement will happen sometime this winter). As for “Holiday Wars” the franchise we have lots of good stuff planned for you loyal readers (all two or three of you). I just picked out which of the “Tales of Holiday’s Past” stories will run first and finished lettering it. It’s a dozy and will seriously expand the mythos of the “HW” universe. Also I finished the rough draft of the prequel novel and we are still on schedule for releasing that late next spring. We are also looking at branching into merchandising, but to be honest our main focus has been and will continue to be the story. Though if any of you readers know of something you’d really want, like t-shirts, buttons, a plushy, or whatever, make sure you let me know.